Not knowing what to do when your dog is choking is a prospect that likely strikes fear into the hearts of many, especially those whose pets are prone to chewing on any object that they can get their paws on. 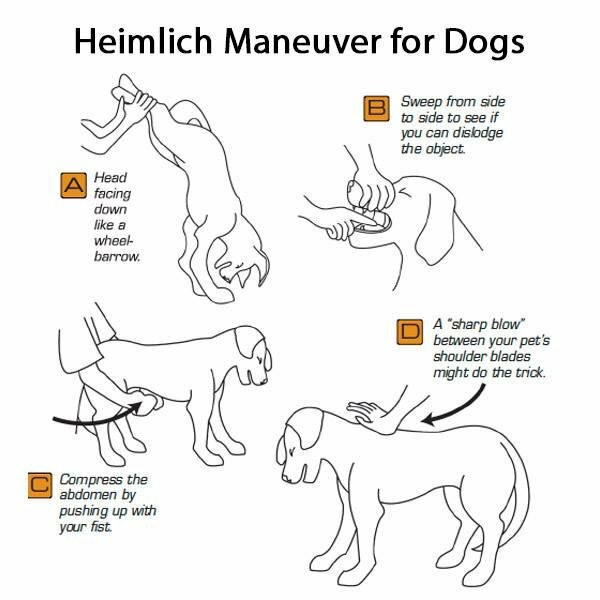 Rather than descend into a state of sheer panic, learning how to perform a Heimlich manoeuvre on your dog could help clear their windpipe safely and swiftly when blocked. A Twitter user who goes by the name Kass has shared a diagram that demonstrates various techniques that you can employ if you find yourself in that particular predicament. The first step from the diagram that she has followed in the past with her own pet is to sharply pat the dog with your hand in between the shoulder blades. Next, she holds the dog by its hind legs like a wheelbarrow so that the object causing it discomfort may become dislodged. The third step involves holding the dog’s jaws open and using your finger to sweep from side to side to see if you can remove the stuck object. Next, Kass uses her fist to compress her dog’s abdomen from underneath. However, if your dog is awake, you need to exercise your judgement when debating whether it’s wise to place your fingers in its mouth or not.